As modern RV models become increasingly reminiscent of houses on wheels equipped with full-sized amenities, there’s one element that may be questionable on the RV front: residential refrigerators. It’s a commonly-known fact that refrigerators designed for use in RVs are engineered specifically to handle a portable environment, but it’s becoming more and more popular to install a conventional version in your home on wheels. There are several major differences between the makeup of a residential refrigerator and that of one you’d find in your RV. The mobile version, also known as an “absorption refrigerator,” has no moving parts responsible for cooling the unit, making it appropriate for bumpy roads or unpredictable driving conditions thanks to its stability. On the other hand, a residential model uses a compressor motor, which may cause problems if you encounter heavy road vibrations. Another difference is that an absorption refrigerator can run off of a variety of energy sources, including electricity, LP gas, or battery power, meaning your RV doesn’t have to be plugged in to an electricity source to cool your food. 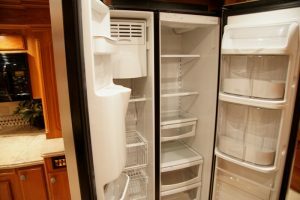 Residential refrigerators run solely off of electrical power, which may be less-than-ideal for travelers who spend more not connected to shore power. However, while RV refrigerators typically need periodic maintenance to keep them functioning properly, a conventional fridge won’t require such considerations. They also generally perform at a superior rate, thanks to their consistent air compressor cooling power, making them a fairly low-maintenance option. Can I use a residential fridge in my RV? Despite the variances between the two models, it’s usually okay to replace your RV’s absorption refrigerator with a residential one, but there are a few considerations you need to keep in mind. One of the most obvious aspects of making the switch is ensuring the opening for the current refrigerator will allow room for the new one. Pay special attention to the depth of the unit with the doors off, but also double check that the new unit’s doors won’t interfere with any other fixed pieces, like cabinets or drawers. When it comes to buying your new refrigerator, be sure to purchase a “counter depth” model, as it will fit most naturally into the opening. To get your old fridge out of the RV, you’ll need to remove the cooling unit from the back and take the doors off, which will help it fit through the window or doors. You’ll also need to take the doors off of the new unit before you bring it in and connect it to the power source and move it into the opening. Once your refrigerator is up-and-running, it will likely be ideal for you to connect it to a circuit on the inverter so you can keep it powered up while in transit. All in all, there are pros and cons to both models. While absorption refrigerators offer more flexibility when it comes to operation without shore power, conventional units may be a more reliable option to keep your goods consistently cool. 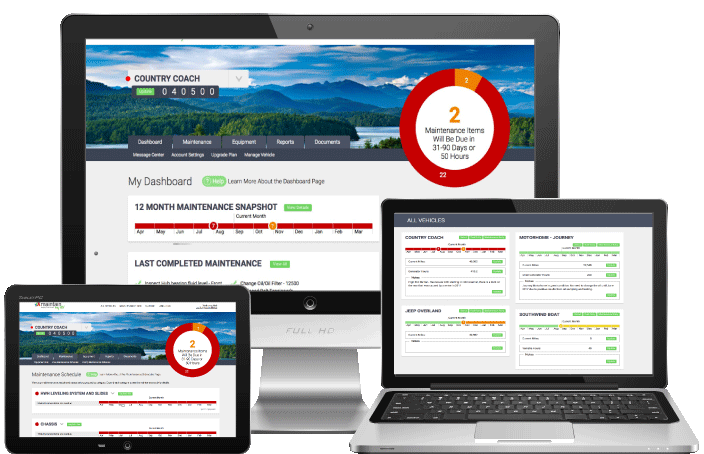 Regardless of your refrigerator preferences, make sure to use your online RV maintenance schedule and logbook on www.MaintainMyRv.com to keep up with your appliance’s needs ensuring you “keep it cool,” no matter where your travels take you.